Join us at the Friends of the Library Annual Meeting as Thomas Edward presents Titanic: A Tragedy of Errors. This program follows the life of the Titanic from the inception of the idea to build a passenger ship that was bigger and more luxurious than any ship afloat to the collision with the iceberg on the night of April 14, 1912. Over forty errors and circumstances will be presented to show that the event should never have happened, and many more lives, if not all, could have been saved. This tragedy was truly a “Perfect Storm of Circumstances.” You will learn why the lifeboats weren’t full and why the ice warnings were ignored. 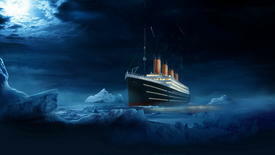 Information will also be presented about the prominent passengers along with the myths and legends of the Titanic. *At 6 PM, a short business meeting will be held before the presentation. Light refreshments will be served the entire evening. This program is free and open to the public. Registration starts on 04/22/2019 at 9:00 am.